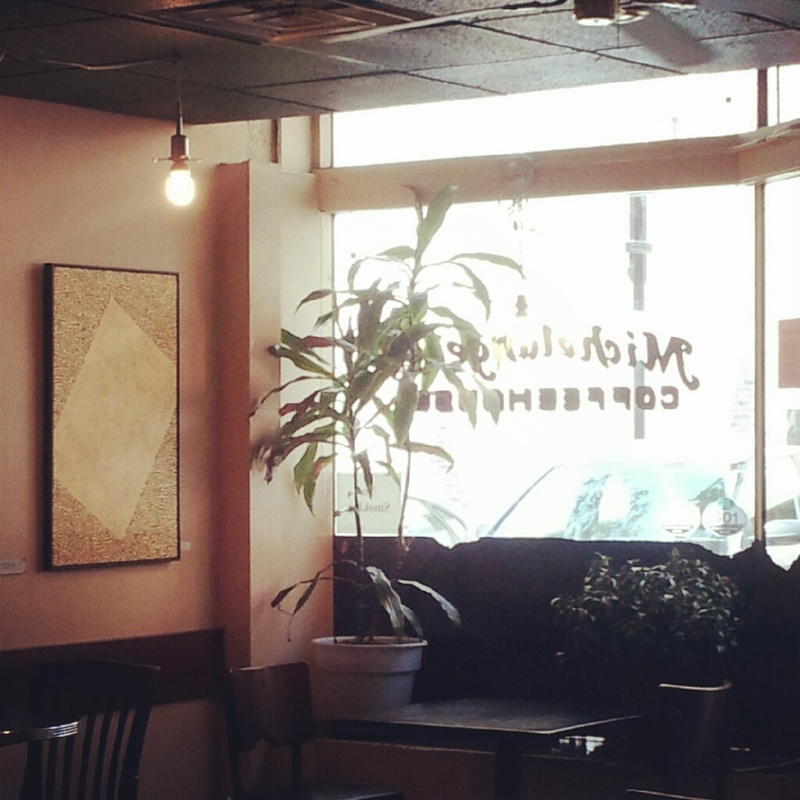 Music plays softly in the background of this eclectic and comfortable cafe – its yellow walls adorned with abstract art. I look around. Faces. Worn, happy, concerned and engaged. It’s amazing how much someone can tell you through a single glance. Light bounces off the adjacent, red brick building and delicately streams through the large windows, as if it were meant to create the relaxed ambience of this place. The wooden door, probably reclaimed from the building’s past life when it housed a bank or a mom and pop shop, squeaks distinctively, swinging back and forth as the last of the lunch crowd leaves. Aside from the two middle aged women reconnecting about their lives and the college student sitting in front of them, the back side of the cafe is now empty. Above me, a fan spins almost imperceptibly as it hangs mounted on the green ceiling tiles. Its blades gently pass through the air, creating a slight breeze that lazily mixes with the distanced laughter of unseen individuals at the cafe’s storefront. My wandering eyes begin to trace the ceiling edge running against the far wall – here, green meets yellow as each stops abruptly before the other, curiously beholding and complementing each other’s difference. My mind stays with this thought…difference. It can be subtle and stark. And often misunderstood. History does not make light of this last reality: male-female, black-white, young-old, Democrat – Republican. Probably not green-yellow though. Not all differences are inherent. But when differences are real and natural, their meeting holds the potential for beauty. When the worn soul meets the joyful smile of another, differences and similarities clash, enabling each to mutually lift the other up. Differences connect in and over similarity, and each is afforded the unique opportunity to become more fully themselves. Edge meets edge. Man meets wife. Black meets white. Created meets Christ. What amazing opportunity God gives us each day to behold beauty and become ourselves. Jon, have you read a book called Conversations with God? I am reading it now and it talked about the duality nature of God. God is a term that we labeled something to which we do not understand. To understand it there must be relativity. Good vs evil. Black vs. white, etc. Thus “God” has effectively “split” itself into halves so that We can get to know Ourselves. Without this duality we won’t know what’s right and wrong, what’s fear and love. I’m very glad that you wrote about it in your blog. If you get a chance, check out that book. It’s a pretty good read (so far at least). I hope to read more as you post. Hiatt, great to hear from you! It’s been a long time. I haven’t read that book yet (I’ve heard of it), but to clarify, I wouldn’t say that God has a dual nature or that I espouse dualism. God, as understood in Christianity, doesn’t split himself into two equal halves (evil and good); this is why I wrote that not all difference is inherent. A better way of writing it might have been not all “difference” is inherent. There isn’t an equal and opposite “god” to God. Satan is not God’s equal, and evil is not good’s eternal and balancing equal. But there still are differences. They’re all around us, and when difference is real and natural, like with man and wife, this exchange of beauty can happen. Hope that makes sense! I know this really only scratches the surface, but feel free to comment back, guy. Hope you’re doing well. Are you still in Philly? I’m still in Allentown, but Philly is close. I just want to clarify that when I wrote the word split I used quotes not because God can physically or otherwise split him/her/itself but rather God provided us with a spectrum of things such that there are normally two ends (i.e. black vs white). And no there isn’t an equal and opposite of God but to compare something good one must understand it’s opposite. That’s what I was saying. Remember Father Mike from UofR during our freshmen year? You had invited him to talk about God but I was too busy that semester and only attended one of his sessions. I wish I attended more sessions and I wish that time was now since I feel more ready to talk with him. Good times nonetheless. Yeah I remember him! Funny that you call him Father Mike. Let’s catch up soon – we can def. talk more about this and catch up too.